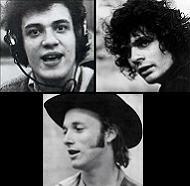 This "super trio" was comprised of Mike Bloomfield (lead guitar), Al Kooper (piano, organ, ondioline, vocals, guitars) and Stephen Stills (lead guitar) who released the seminal LP 'Super Session' in the summer of 1968. Bloomfield and Kooper had met as session musicians in 1965 while recording Bob Dylan's classic LP 'Highway 61 Revisited'. Bloomfield, an accomplished guitarist and member of the Butterfield Blues Band, was already recording with Dylan when Kooper, a well reputed songwriter and guitarist who had been invited into the studio to watch, snuck into one of the recording sessions and started playing organ, spontaneously coming up with the now famous pipes for the classic tune 'Like A Rolling Stone'. Bloomfield and Kooper also played together in Dylan's backup band at the Newport Folk Festival during the infamous "Dylan goes electric" set. After working with Dylan, Bloomfield remained in the Butterfield Blues Band until mid 1967, while Kooper went on to co-form the Blues Project in 1965, remaining a member until mid 1967. After clashing with Paul Butterfield, Bloomfield left to form the short-lived Electric Flag, while Kooper went on to form Blood, Sweat & Tears with Steve Katz. Throughout this time period, Stephen Stills was based in Los Angeles, playing with the Buffalo Springfield. The link between Stills and Kooper can be found through Jim Fielder, bass player for Kooper's Blood, Sweat & Tears, who had also temporarily played bass in Buffalo Springfield during Bruce Palmer's deportation back to Canada for drugs. In the late spring of 1968, Bloomfield, Kooper and Stills all found themselves on temporary hiatuses due to breakups with their corresponding bands Electric Flag, Blood, Sweat & Tears, and Buffalo Springfield. In May of 1968, Bloomfield and Kooper were in Los Angeles and booked two days in a local studio along with Barry Goldberg (keyboards), Harvey Brooks (bass) and "Fast" Eddie Hoh (drums). On the first day, the band recorded the first side of what would become 'Super Session' (tracks 1-5). On the second day, Bloomfield, a heroine addict, didn't show due to an attack of "chronic insomnia". To cover for Bloomfield, Kooper quickly called up Stills who rushed over to fill his shoes on lead guitar and record the second side of the LP (tracks 6-9). The result was a classic jam album including some outstanding original material co-written by Bloomfield and Kooper, but also containing awesome free flowing covers of Bob Dylan's 'It Takes A Lot To Laugh, It Takes A Train To Cry' and Donovan's 'Season Of The Witch', both featuring Stills on lead guitar. The LP, which reportedly cost only $13,000 to record and produce, was incredibly well received, breaking the top 20 and going gold. Due to its success, Bloomfield and Kooper made several concert appearances to support the album. Stills, really being only a temporary substitute for Bloomfield, left to become a member of Crosby, Stills & Nash.